One of those classic debut albums every singer wants...an absolutely wonderful record from beginning to end...includes the hit "Midnight at the Oasis"
Hollywood, CA - Exhibit Records will release Maria Muldaur's critically acclaimed first solo recording on 200g vinyl. 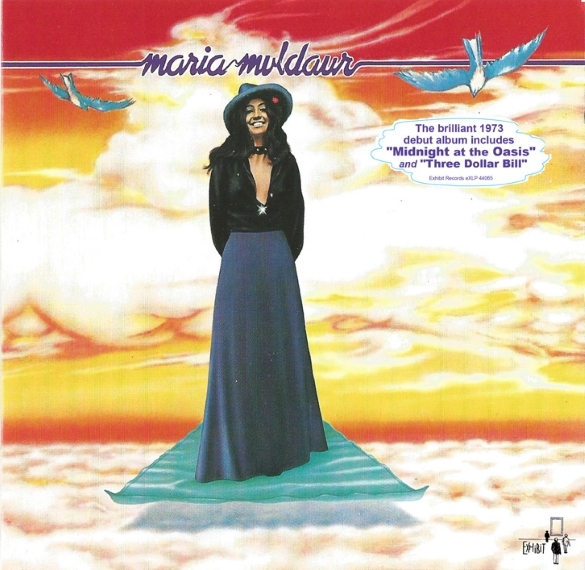 Muldaur's compelling debut features savvy studio vets, talented guests, strong tunes and Muldaur's best-known single "Midnight at the Oasis," a flirty invitation to forbidden pleasure, set in an Arabian Nights desert that falls somewhere between jazz and pop. A well-known music critic declared that "Midnight at the Oasis was probably responsible for the conception of more children than any other song of the 1970's." The recording appeared in 1973, during a moment of great openness in popular music. Her album became an FM staple, she found just the right balance between her commitment to the traditional material she favors and her ability to interpret it in her own quirky and original recognizable singing style. There's not a weak song, a weak arrangement, or a weak performance anywhere on it. This album has elements of rock, pop, blues, folk, country, bluegrass and even vaudeville and somehow, all the disparate elements blend well to make for a cohesive, remarkably unified album impossible to classify as a whole. Among the musicians and vocalists appearing on the recordings are Dr. John, Ry Cooder, Andrew Gold, David Grisman, Chris Ethridge, Ray Brown, Richard Greene, Dave Holland, David Lindley, Bettye LaVette, Bill Keith of Bill Monroe's Bluegrass Boys, solo-Beatles drummer Jim Keltner, solo-Beatles bassist Klaus Voorman, and jazz-guitarist Amos Garrett. But the album's greatest moments belong to Maria alone - her vocal gifts defy expression. After a decade of work this debut recording revealed her art as mature, sophisticated, sensual and wise. The songs and performances are sweet, poignant, salacious, intelligent and attractive. The high point may well be Wendy Waldman's "Mad Mad Me," which closes the album with the most hauntingly gorgeous two minutes and fifty-three seconds ever recorded. The new 200 gram vinyl record is beautifully presented in a sturdy old style tip-on gatefold jacket featuring the original album art work. The popular recording joins an expanding list of high quality vinyl releases being made available from the emergent Exhibit Records. The Hollywood company has rapidly curated an eclectic catalog of classic recordings and is gaining notice for their exquisite mastering, high quality pressings and detail to the fine art of exceptional package design. Maria Muldaur is simply one of the great singers of all times. She could sing anything and make you love it. For those with eclectic tastes, this is a masterpiece. At the time of its original release Rolling Stone magazine called the record "One of the half-dozen best albums of 1973." What Maria Muldaur did back then and is still doing, is recording excellent and eclectic albums, covering different music genres and displaying formidable musical knowledge - there's a huge love for music in this supremely talented artist.